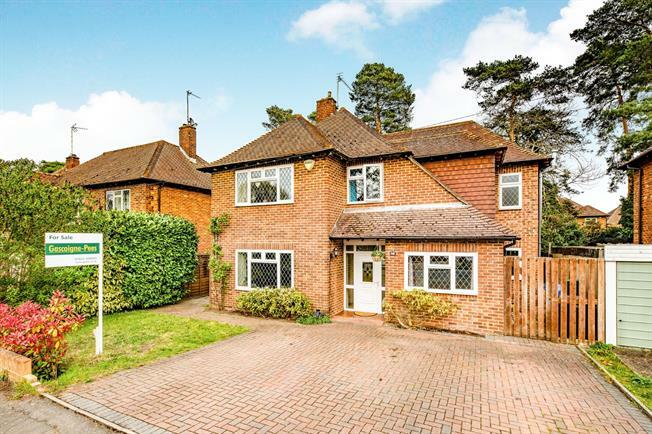 A substantially extended/remodelled four double bedroom detached home set along an established residential road. Having been home to the current owners for twenty years and now benefitting from an open plan 21 x 16 kitchen/breakfast room (with island, eye/low level units and corian work tops) the space offers fabulous entertaining space with additional light taken in from the glass ceiling lantern. From both the family room and kitchen there are views/access direct to the patio/garden where the Chinese sandstone extends the full width, offering a varied and rich depth of texture. From the kitchen there is a separate utility room and two useful storage cupboards. With four reception areas and four bedrooms the accommodation is proportionately balanced whilst in the master bedroom there is fully fitted wardrobes and a fully tiled separate en-suite bathroom. Outside there is parking for several cars and access front/rear with paths on both sides leading to the rear garden. The property has full gas central heating and has been decorated to offer a fresh modern decor including LED lighting in the majority of the home (except living room, family room and bedroom two). In the garden there is mostly lawn with the advantage of a useful wooden cabin located toward the rear boundary and fully fenced perimeter. Ideally located between West Byfleet and Woking there is the option of either mainline railway stations, both offering direct line services into London Waterloo. For families the local Pyrford junior school (with an outstanding OFSTED rating in 2013) is within catchment.